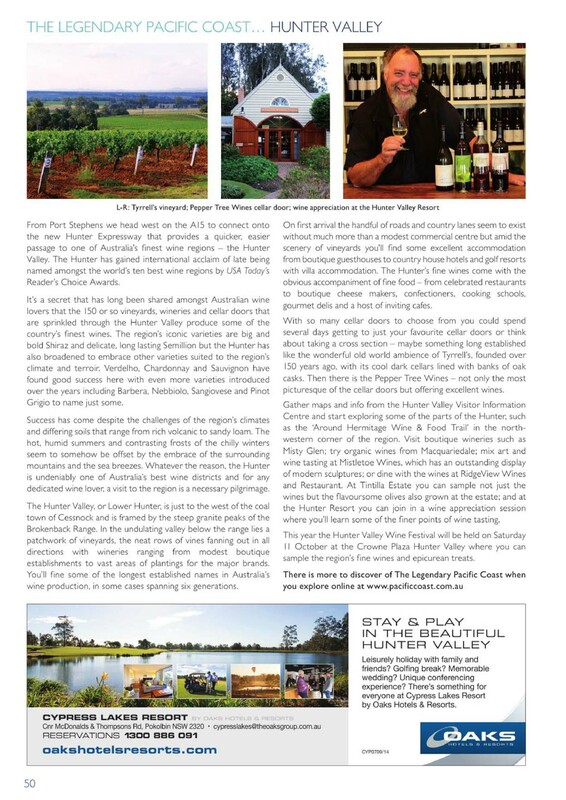 “From Port Stephens we head west on the A15 to connect onto the new Hunter Expressway that provides a quicker, easier passage to one of Australia’s finest wine regions – the Hunter Valley. The Hunter has gained international acclaim of late being named amongst the world’s ten best wine regions by USA Today’s Reader’s Choice Awards. It’s a secret that has long been shared amongst Australian wine lovers that the 50 or so vineyards, wineries and cellar doors that are sprinkled through the Hunter Valley produce some of the country’s finest wines. The region’s iconic varieties are big and bold Shiraz and delicate, long lasting Semillon but the Hunter has also broadened to embrace other varieties suited to the region’s climate and terroir.